When an Air France A380 suffered a serious engine failure that ripped off the front of the engine and damaged the wing, the pilots made an emergency landing at Goose Bay, Newfoundland. Now, Air France has a plan to repatriate the airliner. 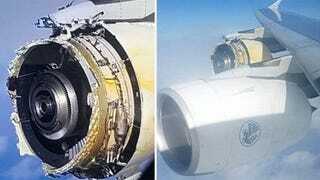 The damaged engine has already been removed and flown back to Wales for inspection, and Air France plans to replace the damaged engine with a non-running spare, then take off and fly back to France on three engines. The replacement engine will likely just be windmilling in place. An A380 captain took to Twitter to explain the procedure.